Sigurður Guðjónsson has produced a remarkably large and consistent corpus of video and audio art. 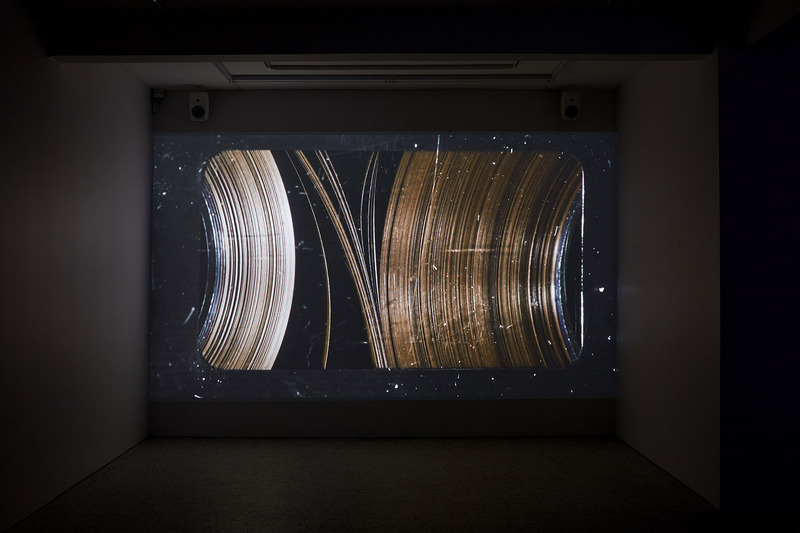 He records images – natural objects and sounds, machinery, man-made infrastructure and technological relics – with a minimalist sensibility that nonetheless is attuned to the many layers of meaning and association that his moving images carry. 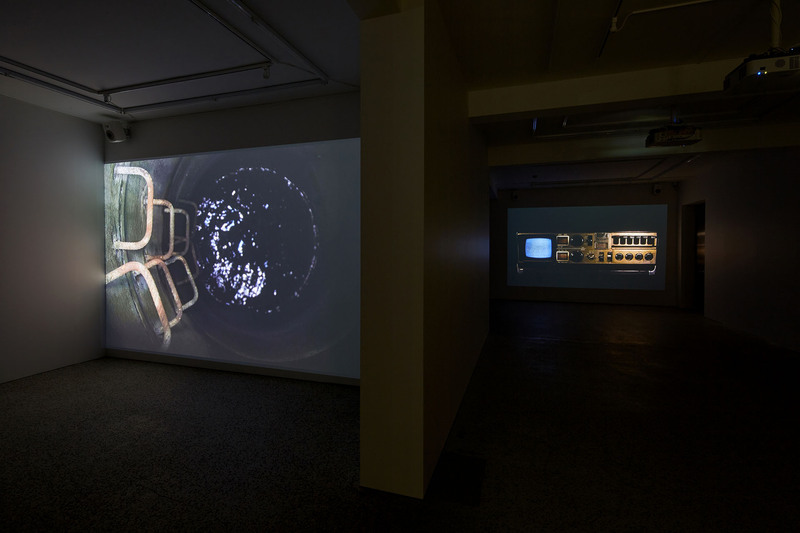 His works are as much about the audio as they are about the video images and in exhibitions he coordinates the pieces so as to produce an overall, synchronized soundscape. This exhibition in BERG Contemporary shows new works that build on and develop Sigurður’s distinctive approach, his attention to detail, his pared-down presentation and the conceptual complexity that makes his work so interesting. Entering the exhibition one first hears only sounds: Electronic noise, a mechanical whirring sound and water dripping in the distance. The videos reveal the sources of these sounds, three looping sequences that seem almost static from a distance with only single moving element in each shot. Like Sigurður’s earlier work, they are starkly beautiful and their repeating movements and sounds are mesmerizing, but they are also dark and slightly menacing, their static frames and repetitive action hinting at pent-up forces and unseen mysteries. 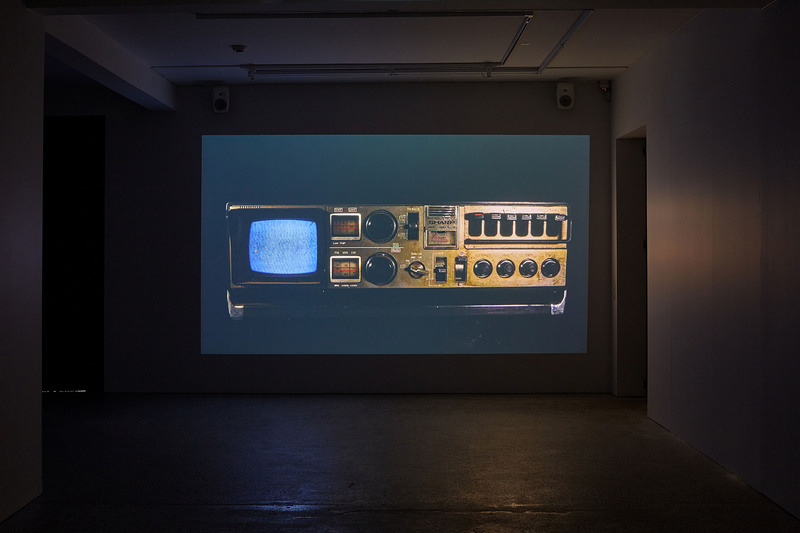 In the work AV Machine we see a curiously old-fashioned, combined cassette player and television, with a the screen not much bigger than a business card. The screen is turned on but we see only black-and-white interference, a fuzzy noise, and the sound is the fuzzy audio noise of a receiver that can find no signal to receive. On the one hand, it is just a piece of obsolete technology. On the other hand, concentrating our gaze on the image, we may be tempted to read more into it. For those who are approaching sixty and actually remember gadgets like these, it may be a symbol of innocence lost or faded dreams – forever seeking a signal that is no longer being broadcast. Others might interpret it in purely aesthetic terms, an ancient object to be contemplated like a ruin or a monument. In any case, the object, the image and the soundscape are ambiguous. They present three distinct layers of abstraction that combine to evoke these different associations and interpretations. In Tape we see another evocation of recently outmoded technology. It is a close-up of the small window in the middle of an audio tape cassette, through which one can see the tape being wound from one spool to the other. Somehow, in close-up and with hindsight, this mechanical process comes to represent much more. It conjures up memories of a Beckett play, of 1980s mix tapes and uncountable underground editions of the most interesting art and music. We can see the moving image as a representation of the orbits of heavenly objects or as an impossibly complex calculus problem. It is impossibly complex because it is mechanical, messy and unpredictable – and that is its charm. Having reached the digital age, with impeccably accurate sound reproduction and lossless reproduction, we find aesthetic qualities in the imperfections and distortions of earlier electronic equipment. What we see in the videos projected on the wall is not just the image, but also the medium itself. Sigurður has made these videos with contemporary digital equipment and that adds another layer of meaning to the exhibition. 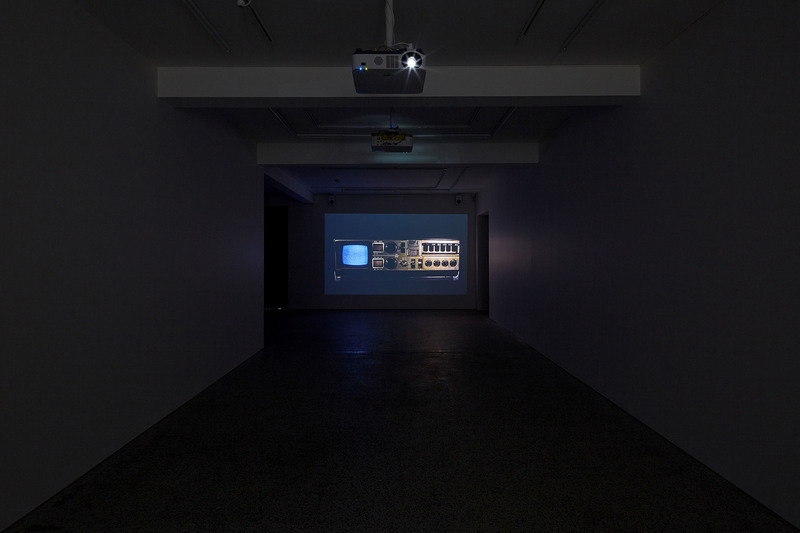 The images in AV Machine and Tape pull us back to the time in the 1960s and 1970s when artists were beginning to explore these new technologies, the time when Steina and Woody Vasulka, Nam June Paik and many others were seeking to unlock the potential that these new gadgets might offer for artistic expression. We can interpret Sigurður’s works as an homage, as nostalgia or as a purely formal exploration of potential of imagery and sound. Again, we find them ambiguous but this ambiguity expresses the very core of artistic practice and the sort of thinking that goes into making good art. Art is a conflicted pursuit. On the one hand, artists look backwards, sticking to aesthetic criteria and engaging with their materials in a way that most people – in the age of computers and ready-made meals – find impossibly complicated and tedious. On the other hand, they have always embraced technological innovations and have often been at the forefront in developing new techniques. When we look at older art – be it Roman, renaissance or just a few decades old – it seems very settled. The colors, textures and composition are familiar to the point where we take them for granted. In their time, however, many of these works, mostly paintings or sculptures, were startlingly modern. The colors might have been novel, recently imported from the orient or devised by chemists. The perspective may have surprised viewers, being achieved with some new device or topographical calculation. Throughout history, artists have embraced the latest technological advances and incorporated them into their production. Video art – a recent development – may be no more startling than a painting by Giotto was in the fourteenth century. In some ways, in Sigurður’s works, we find an echo of earlier experiments: the stark presentation that recalls the still life paintings of 300 years ago as much as it does the hands-on exploitation of low-tech equipment in the early experimental films of Man Ray and other Dadaist pioneers. 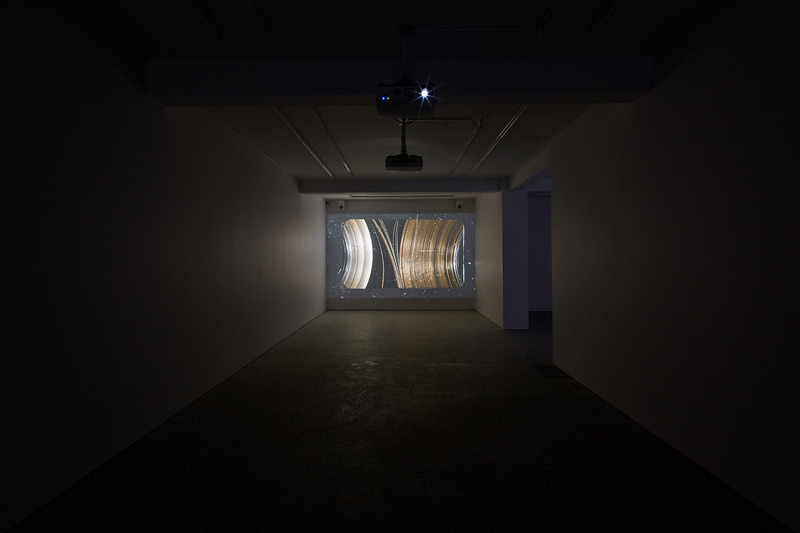 The final piece – that may be the keystone to any reading of Sigurður’s exhibition in BERG Contemporary – recalls his earlier work where man-made constructions, often in decay, provided the setting and allowed him to manipulate the sound. Well is a video shot down a man-made, mass-produced concrete well of the type that is used to access our below-ground infrastructure, the mass of pipes and cables without which we would be helpless. Looking down, though, with a pool of water at the bottom reflecting the light from above and the sound of water dripping, the space becomes a cathedral or an untouched natural cave – depending on your inclination and interpretation. As we pass further beyond the industrial age the boundary between us, the natural environment and our growing mountains of scrapped and outdated gadgets becomes ever less distinct. 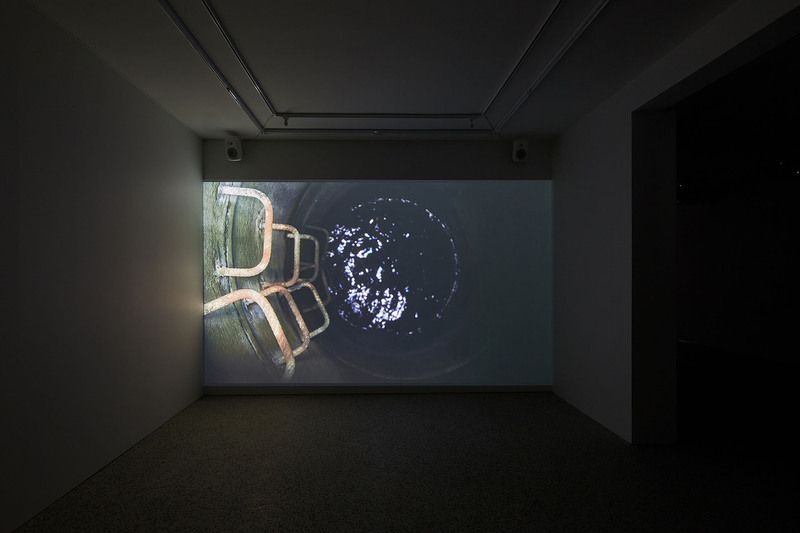 Passing through the exhibition with its hypnotically repetitive images and overlapping soundscapes we end up in a meditative space, a man-made oasis of the mind where dripping water seems to offer a way back to a more natural space, a redemption of sorts.